Libby, Susan and Lyn meeting Alessandro Cortes. 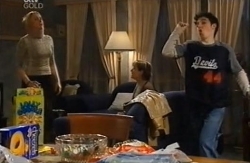 Stingray blurting out to Sindi that Toadie wants to marry her. Lyn is waiting at the pub, on her mobile, for Susan because they were going to break Alessandro's heart in person there. Susan isn't able to go though, much to Lyn's dismay, because of Janelle turning up on her doorstep. Meanwhile, Janelle has sugared up Stingray good and proper by giving him a bag of lollies and chips as a hello present. She also makes a good (second) impression on Susan. “You know what I had you pegged for? A flamin' stuck-up moll!” Suse is suitably charmed. Janelle then adds that she was wrong and she's grateful for the care Susan's given Stingray over the past few months. Stingray asks his mum what happened to her neck (she's wearing a neck brace) and she tells him someone rear-ended her in her car. That's why she's in Erinsborough; she wants Toadie to help her win a court case. Janelle also works her charm on Sindi – by calling her Wendy, and then asks if Suse could help her out by finding an extension cord she can run from her caravan to the house. Lou is giving Lyn a pep talk for her meeting with Alessandro just as the soapie stud walks in the door. Lyn pretends it's a surprise to see him there but then cuts to the chase. “Libby can't be here because… because she's had to move to Shepparton to be with her boyfriend, Darren.” Alessandro is confused, Libby never said anything about a boyfriend to him. Janelle remarks on how different Stingray's behaviour is but she doesn't really want to listen to Susan's explanation of why (a better diet etc). She also brings up Wendy's exotic dancer past but isn't offended by it; “I would have gone in for it myself if I didn't have so many carpet-weasels underfoot all the time.” Stingray apologises for not sending Janelle any money last week but this is news to Janelle. She figures out that Stinger's dad had been keeping the money for himself, and now he's nicked off. “Again?” exclaims Stingray. Janelle doesn't care though; she's better off without him she reckons. Stinger hugs her. He's really happy to see her. Lyn is still trying to get it through Alessandro's head (and multiple layers of shiny, shiny hair) that Libby has moved on and he needs to do the same. He doesn't believe her though and finds the whole story very farfetched. “I've been in soap far too long, I know a cover-up lie when I hear one.” He says for Lyn to tell Libby he's not leaving town without her. Stingray is pretty hyped up on sugary goodness by now much to Susan's worry. Janelle says he's fine and gives him a warning not to choke on anything as an aside. She marvels over Dahl but the bird doesn't share the same sentiments and whips her head away in distaste. Stingray meanwhile has taken heed of his mum's warning and is now choking on a lolly. They all rush over and try to Heimlich him but he spits it out eventually. Susan gets angry and she starts to bring up the junk food/behaviour link again but Janelle says she knows Stingray better than her thank you very much. She takes Stinger out to the caravan for a night in front of the telly leaving Susan and Sindi quite bewildered. Janelle appears out of the caravan in the morning and tries to steal Harold's newspaper from the letterbox. Harry's on the case though and catches her in the act. She makes quite a scene about it all, crying wolf to Stu when he appears outside in his police uniform. 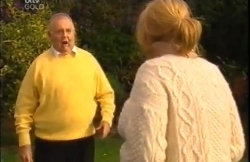 “You're a flamin' perv and your muffins stink!” she spits at Harold. Harry tells her to “keep the bloomin' paper” if she's going to be like that. Stingray is finding the exchange quite funny hidden away in the van until he sees Stu looking at him. Toadie is freaking out because Janelle's in town, and oh my God! She's at the front door! He's too late to lock it before she bursts in and hugs him, throwing in a punch to the guts for good measure. She asks if Wendy told him what happened to her neck. Toadie's confused until he realises she means Sindi. Janelle wonders if she'd get a million in compensation or if that's not enough. Either way, she's hungry and tells them all to come over to Suse's for some brekkie. Susan tries to encourage Stinger to have some fruit salad but he's too busy scoffing down bacon. Janelle gets on Sindi's good side again by bringing up Ch44 and then insinuating that it's a ‘blue' channel. Sindi gets quite annoyed but Janelle says she's only having some fun. 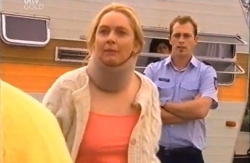 Toadie tries to get some more information out of her about the neck injury but she goes off on another tangent. 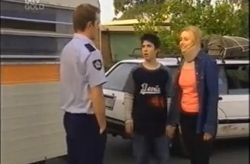 Sindi can't stand seeing Toadie getting taken advantage of so she excuses herself, telling him to try and not get taken for a ride, before walking out the door. Susan follows. Susan thinks that Sindi shouldn't be so rude to Janelle and that she's had a hard time raising six kids, but Sindi won't hear of it. “She is a bludger in need of a good kick in the pants!” She adds that she thought Susan would have stuck up more for all the hard work she put in with Stingray. Toadie lets Stingray loose outside because he's jumping around like a maniac in the lounge room (Stinger suggests they drive the car straight into the lake which I thought was a little odd considering Toad's past issues with cars and water!). He follows him out to make sure he doesn't set anything on fire (which I also found weird considering our friend Luka the arsonist). Susan expresses her relief when Janelle stops singing in the shower but speaks too soon as the Australian Idol audition starts up again. What an excellent houseguest. I wish I had a houseguest as considerate as her. Susan notices that Sindi looks worried and Sindi confesses that she thinks she has to marry Toadie. Lyn is sitting down with Alessandro telling him a few home truths. Namely that all of Libby's troubles started when she was orphaned at birth, left to fend for herself on a desert island by her foster parents, while her evil twin sister ran away with her first love and she suffers from a rare blood disease called Karinski's Syndrome. Summer walks in pretending to be Libby's daughter, all upset because Alessandro is “making her mummy sick again”. Lyn says that if Libby is off her meds for too long she goes a little crazy and has to go to the institute. Harold makes his cameo as Prof. Karinski, complete with an accent that makes him sound like a baddie from a Bond movie. Oh, and he's Summer's dad. Alessandro calls a stop to all of the mayhem, saying that he came there to meet Libby, “not a bunch of escaped lunatics,” and asks what's really going on. Harold and Summer slink off as the plan crumbles, as does Lou who has been watching on in amusement in the background. Sindi admits to Susan that she's frightened to knock back this proposal in case he never asks her again. Susan says she can't get married out of fear and that it's supposed to be a union between two people who are madly in love with one another. “Maybe you're just in love with the idea of being married,” Susan gently suggests. Sindi wants to know how you know you're in love but Susan replies that only she can answer that. Lyn explains the reasoning behind her crafty plan to Alessandro but he says that Libby wouldn't just up and leave like that. Through a tearful confession we find out that Al thought Libby was his soulmate. Aww, poor lil tiger. Lyn enlightens Alessandro in a motherly way that that's exactly what Libby and Darren are and that's why she left. Al finally accepts the truth and tells Lyn to tell Lib to give her his best. And that Prof. Karinski should stick to his day job. Heh. Stingray rushes Lyn over to style his mum's hair for her. Janelle gives her a handshake and tells Lynnie she was thinking about becoming a hairdresser too. Lyn compliments her and says she has artist's hands. Toadie is still trying to get details of his aunt's case but she kicks him out of his own home so that Lyn and herself can talk makeovers. Stu is inspecting Janelle's caravan and stops to have a word with her as she and Lyn walk out of Number 30 looking like best buds. Stu informs Janelle that she'll have to move her van to the caravan park down the road because she doesn't have a permit. Stingray appears and gets up in Stu's face telling him to leave his mum alone. When Stu leaves, Janelle tells Stingray a secret; he's her absolute favourite kidlet. Stinger looks quite stoked because he thought he was always further down the food chain, but Janelle says that was always his dad's doing. She also asks a favour from him – she wants him to ask Suse for a lend of her nice moisturiser she saw on her bedroom table. He sprints off to get it. Toadie is telling Susan that she doesn't have to put up with his aunt's presence; he knows how the whole Timmins lot can be bludgers. Stingray arrives at the door just in time to hear this and immediately goes into battle mode. He lunges at Toadie, trying to punch him and calling him a snob. Toadie slam dunks him on the couch and holds him there so he can calm down. Stinger yells that Toadie should just say everything to his face.